HIREC, the super hydrophobic water-repellent coating material, provides hydrophobic coatings with a contact angle of 150° or more between an object and water droplets, resulting in higher performance and durability. Conventional water-repellent coatings, by contrast, can only provide a maximum contact angle of approximately 100°. Provides super water repellent performance and excellent durability. Is developed with the optimum material design of water repellent base material, varnish, solvent and additives. Has proven excellence over 20 years of example cases in public infrastructure and on field equipment. 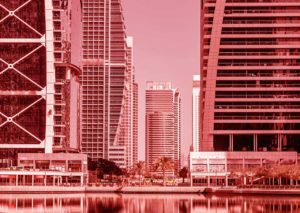 Contributes to stable operation and operation cost reduction of public construction and field equipment such as antennas, radomes, towers, bridges, vessels. Realizes a contact angle between an object and water droplets of 150° or more. When water droplets fall on HIREC-coated surfaces, they instantaneously disperse into smaller droplets, as they are repelled. 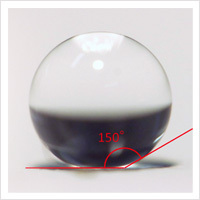 The water droplets remaining on the coated surfaces are round and maintain a spherical shape as if they are standing-up(See the picture above). Performs water-shedding surface without water film. Is equipped with a self-cleaning function, resulting in maintaining excellent water repellent performance over the long-term. Contact angle between an object and water droplets of 150° or more. Remarkable hydrophobic water repellency in outdoor usage for 3 years. Highly durable water resistance in 3 months water immersion test. Beneficial counter measures against water, water film formation, condensation, snow and ice accretion. In winter, snow can accumulate on BS dishes, which may cause reception problem of satellite TV. The water repellency of the dishes degrades in prolonged use, and the reception signal of BS deteriorates by a water film or an icing film formed on the dishes. The HIREC super hydrophobic coating on the dishes is an effective countermeasure against such BS reception problems. Reception problems in winter caused by snowfall can be reduced by HIREC, the super water repellent coating on satellite dishes. The following figures show conditions of the weather and reception conditions of satellite TV systems in snow season. They were measured in Yuzawa town(*) in the northern Japan. The TV system has been installed for 26 months. The snowfall and temperature changes are shown in the conditions of the figure. 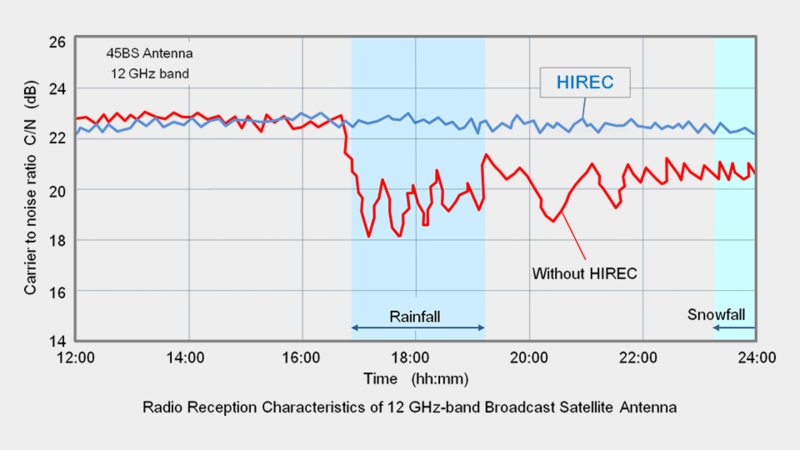 With HIREC: Almost no deterioration in signal reception was observed. Good reception condition was kept during and after snowfall. Without HIREC: Reception signal deteriorated as snowfall. The signal reduction was observed even after it stopped snowing, until varnishing water film by rising temperature. The following figure shows an example of the BS reception problem time. It was measured during 54 days in winter in Yazawa Town(*). 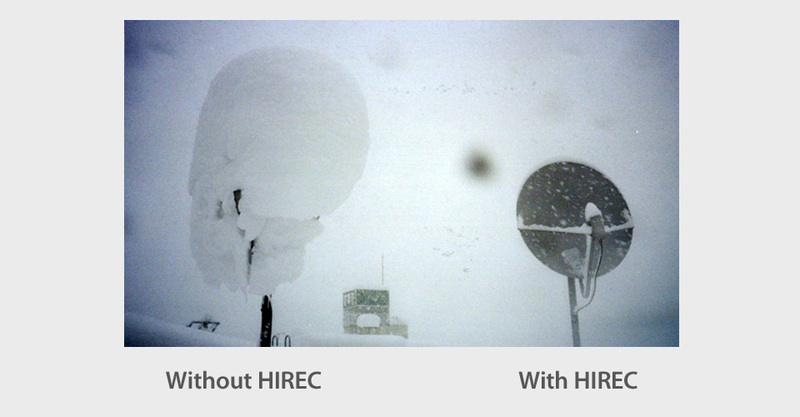 With HIREC: No reception problem was observed and a good reception was kept during the winter. Without HIREC: Reception problems were observed in 15 days during the period. Eight (8) hours lasting problem was observed in the night of Dec 18th. Note * : Yuzawa town, Niigata, Japan. Northern latitude 36.75 degrees, east longitude 138.59 degrees, elevation 340 m. Maximum snowfall is 200 cm - 350 cm.